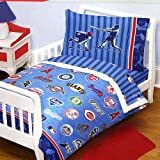 One toddler bed sheet 45 x 70 inches (114 x 178 cm). One toddler fitted sheet. Both of the above fit a standard crib/toddler mattress of 28 x 52 inches (71 x 132 cm). One standard 20 x 30 inches (51 x 76 cm) pillowcase to fit 20 x 26 inches (51 x 66 cm) pillow. This entry was posted on Tuesday, December 21st, 2010 at 9:19 pm	and is filed under Quilts for Kids. You can follow any responses to this entry through the RSS 2.0 feed. You can leave a response, or trackback from your own site.